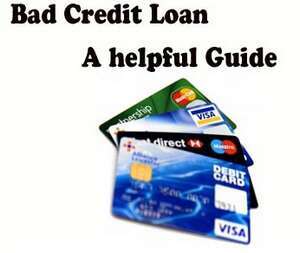 Getting a bad credit loan can be challenging. There are several ways, and much will depend on how bad your credit is, if you’ve been able to improve it, and what your current income is. How long you have been employed at your current job may also be equally important. A bad credit loan can be yours, but you’ll probably have to pay more in interest and other loan fees, and you may also be asked for a significant down payment. It may also affect the amount of money you can borrow. It would almost definitely be harder to get a loan to buy a house, than it would be to borrow just a few hundred dollars for a car repair. And really, that makes sense, as much as I hate to say it. After all, your credit says a lot to possible lenders. It says, “ I’ve had really good luck, never had something come up unexpectedly, and I’ve always had plenty of money”. It can also say “I’ve had a lot of challenges, some bills are more important than others, but I’m doing my best to get better”. What it should never say is “ I haven’t paid anything on time in X number of years, and I’m looking to borrow some money so I can do the same thing to you. You need to show that yes, there are credit challenges, but these are the reasons why, and this is what you’re doing to make sure it doesn’t happen again. Choosing your lender is a big step to ensuring that you get the loan you need. There is an excellent chance that the big, national bank up the street will politely decline your loan application without a thought, but a smaller and more personal bank might take circumstances into account. Your chances of getting a loan increase if you apply with the bank you currently have. Your chances of getting a bad credit loan go up if you are fortunate enough to have banked with that smaller bank for a significant period of time. If you are looking for a new bank now, that might be something to keep in mind. So, now that you know it may be harder, but it is very possible to get the bad credit loan that you need, the next decision you’ll need to make is how much to borrow. If you are borrowing just enough to get through till payday, it’s important for you to be sure how much that is. If you’re borrowing money for college, you should make sure that you have communicated with the school about the total cost, and that you have been screened for any possible financial aid. Regardless, debt is a serious matter. It’s easy to get into and so very hard to pay off, so never borrow more than you can afford to pay back. You may able to negotiate a lower interest when you have a co-signer with good credit, so if that’s an option for you (and you’re not nervous to ask them), that might be a good idea. However, it’s important to know that a co-signer is basically saying that if for any reason you do not make the necessary payments that they will do so. You should also probably look into as many loan sources as possible, to assure that you get the lowest fees possible. And never give up, because “bad credit” may just be an interesting challenge to the right lender!